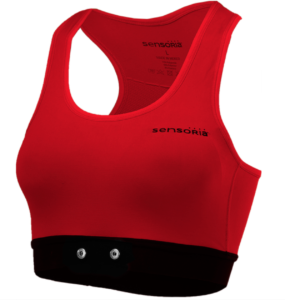 Monitor heart rate with embedded technology for the most effective workout with Sensoria’s smart garments. Sensoria aims to introduce technology with meaningful impact through natural and intuitive ways. The brand has developed a platform comprising proprietary textile sensors, electronics, mobile application and cloud infrastructure for the development of smart garment solution for your workout. 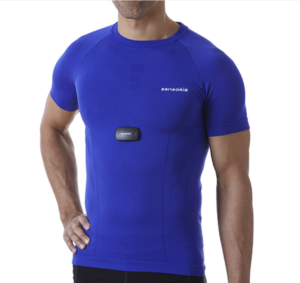 The Sensoria Fitness Smart T-Shirt offers a comfortable and close-to-body feel. It provides you with accurate and consistent heart rate monitoring without the hassle of wearing a strap. This T-Shirt can be used with most Bluetooth Smart heart rate monitors with standard snaps and when you pair your HRM with the Sensoria Fitness mobile app—you can track your fitness activity at any time! With the same heart monitoring technology and app connection, the Smart Sports Bra allows women a different way to track their activity! The sports bra offers a comfortable low/medium support and made of 74% polyamide, 18% polyester and 8% elastane, the Sensoria Fitness Sports bra is light and breathable to minimize body temperature fluctuations. The sweat wicking technology alleviates discomfort by removing humidity and allowing your body to stay dry in all climates. 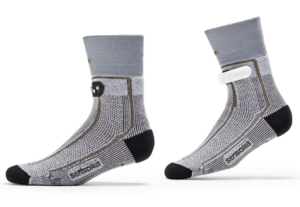 Fused with 100% textile sensors Sensoria Fitness Socks and Anklet, delivers superior accuracy in step counting, speed, calories, altitude and distance tracking, but goes well beyond that to track cadence, foot landing technique as you walk and run. With the Fitness Socks and Anklet, Sensoria can even help you identify injury-prone running styles (heel striking, ball striking, etc), saving you a trip to the doctor! The online USA Sensoria store has by far the largest range of Sensoria products in the world. The USA Sensoria online store unfortunately does not offer international shipping. Not to worry though! Big Apple Buddy, your personal shopper, can help you buy products from the USA Sensoria online store and ship them to your doorstep, no matter where you are in the world. We offer international shipping to over 110 countries including Australia, Austria, Azerbaijan, Bahrain, Belgium, British Virgin Islands, Brunei, Bulgaria, Canada, Chile, Costa Rica, Croatia, Czech Republic, Denmark, Estonia, Fiji, Finland, France, French Polynesia, Germany, Gibraltar, Greece, Greenland, Hong Kong, Hungary, Iceland, Indonesia, Ireland, Israel, Italy, Japan, Jordan, Kuwait, Latvia, Liechtenstein, Lithuania, Luxembourg, Macau, Malaysia, Maldives, Malta, Marshall Islands, Mauritius, Monaco, the Netherlands, Netherland Antilles, New Zealand, Norway, Oman, Poland, Qatar, Romania, San Marino, Saudi Arabia, Serbia and Montenegro, Seychelles, Singapore, Slovak Republic, Slovenia, Spain, South Africa, St. Lucia, Sweden, Switzerland, Taiwan, Thailand, the UAE, the UK, Vatican City, and Vietnam. If you would like to buy from the USA Sensoria online store, simply let us know which items you would like to order (by filling out the form below) and we’ll get back to you with a free international shipping quote within 24 hours!